Walking back from school, a group of children were terrified by the blasts of bombs which started to land in their neighborhood just outside of Homs, Syria in November 2012. They sought refuge in their grandfather’s house. Unfortunately, their shelter was not safe; the next mortar hit the house claiming the lives of 10 children including three sisters of Hussein and seven of their cousins. Hussein, now a 10-year old boy, was at Grade 1 at the time of the incident. “Right before the explosion, my cousin was asking me for a cup of water; then I remember how people were transporting me to hospital, and then I vanished…” recalls Hussein. At the hospital, Hussein was considered dead and transferred to the hospital morgue, as was the case with the other victims. The family was informed about the loss of four children, Hussein and his three sisters. The next day, when the cold chamber was opened to prepare the bodies for burial, one staff member found Hussein still alive but unconscious, shaking from the cold. They then rushed him back to the hospital for reanimation. Hussein recovered well and spent two weeks in the hospital following an amputation surgery to his two thighs. One year later, the family was displaced and settled in Tripoli, north Lebanon. In April 2014, Hussein was identified by the World Rehabilitation Fund’s team and was referred for prosthetic fitting to a partner organization. Hussein then completed his training on using his two ‘Above the Knee’ prostheses. “I feel very happy walking again with my new legs. I plan to go back to school and practice sports. In the future, I dream to become a teacher”, says Hussein. 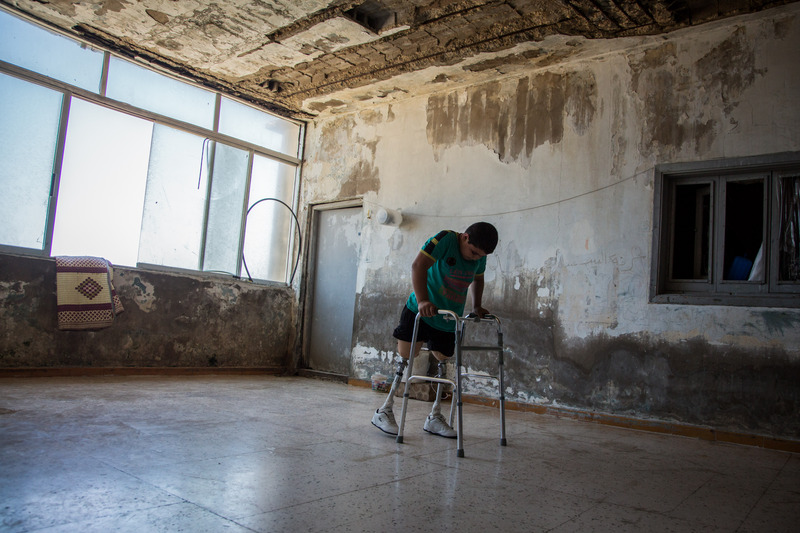 Hussein’s mother adds: “His morale has improved significantly since he was fitted with the artificial limbs. He is very enthusiastic to invite all the family and hold a party soon”.